When you land on Shark Tooth Island, you will be standing on top of a sign. 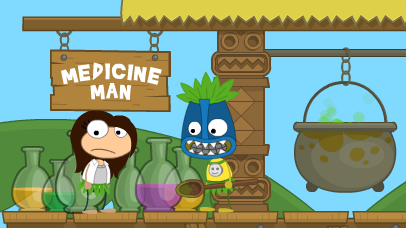 Get off of the sign, and go right until you see a poptropican next to a coconut stand. Click on him, and get the carbonated coconut milk. Then go right and into the Tourism Center. Go all the way up and talk to the girl wearing pink. She will tell you about the island and to read the statue of Professor Hammerhead. So, do as she says, and go down to the statue. Click on it to read the plaque. Exit the Tourism Center, and directly right will be a building shaped like the head of a shark. Enter the building. Go down to the platform below the one you’re on now, and click on the journal. 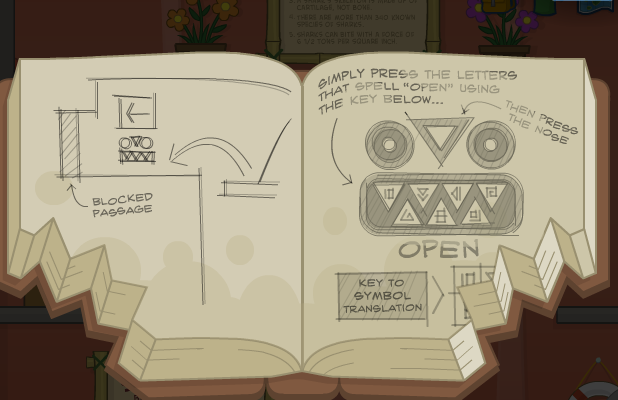 There is a large chunk of the journal missing, leaving the symbol translation key a mystery. Close out of the journal. Go right and into the next area. You are now in the Temple Ruins. Go right, watching out for falling coconuts, and push the stone block until its under a vine. Now jump on the vine, and climb until you get high enough to get on to the platform. Jump on to the next platform, and from there jump left onto the top of the temple. Keep walking left, and there will be a piece of paper. Collect it, and now you have the missing symbol translation key. Get off of the temple and go inside of it. Jump onto the swinging platform to the left, and as it swings left, jump onto the platform below it and to the left. Go left and fall onto another platform. Walk off of this one, and land on the plank floating in the water. Jump over the wall in the water and through the gap to the other side, but be careful about the bat. Go left, and jump up onto the platform attached to the wall. Jump onto the sliding platform to the right of it, and jump onto the platform above it as quickly as you can so that another bat does not hit you. Jump onto the swinging platform, wait for it to swing left, and jump onto the area with the face that resembles the one in the journal. 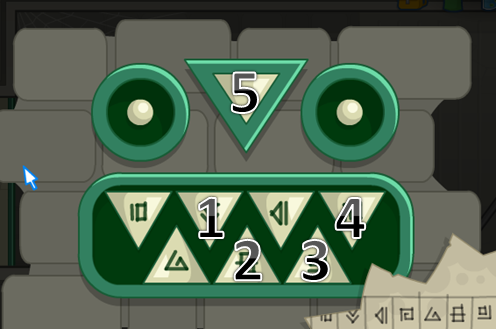 The eyes will glow green, and the wall blocking your way will be lifted. Go left, to the next area. Jump onto the vine to the left of you, and climb a little high before jumping off of it to the left. 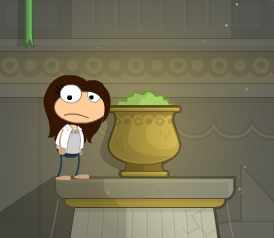 You should land on a platform with a poptropican dressed as a bat. Click on him, and he will tell you that he senses a bone nearby. Jump off of the platform, and onto the shark statue. There is a giant caterpillar moving along the statue, and it can knock you off, so you may want to wait until you see it pass by you before climbing to the top of the statue. From the top, jump onto the swinging platform and wait for it to swing left. Jump onto the platform to the left, and to the next. walk to the end of this platform and jump down, being careful not to touch the spikes. In the case that you landed next to the hole, go down the hole. If you fell through, that’s what you should have done. There will be a bone to the left of you, just like the bat man said. Collect the bone. Go right, and jump on to the platform to the right. Keep going right until you see the shark statue again. Climb back up to the top, and back onto the swinging platform, and keep going left until you’re back on the platform you jumped from. Don’t jump down this time. Instead, there will be a small sliding platform that you will need to wait for and jump onto. It will bring you across the large gap. Go left, to the next area. 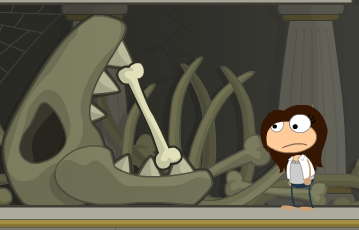 There will be a mural on the wall, showing the shark terrorizing the poptropicans of Shark Tooth Island. It then shows them making a potion with a bone, coconut milk, and a special ingredient and putting it into a coconut, feeding it to the shark, and the shark falling asleep. Keep going left, and the special ingredient will be on an altar. Collect it, and climb up the vine and to the left, exiting the temple treasure room. You will emerge on Main Street. Go right, to the next area, and again go right, to the next area. There will be a man there selling grass skirts. Click on him and he will give you one. Put it on and go back to the temple ruins. Go left, jump over the stone block, and push it back under the vine. Climb the vine and jump onto the platforms until you get an option to go up. Once you do, go up. Climb up the vine, and keep jumping up platforms and climbing vines until you get to the same platform as the medicine man. Click on him, and he will brew you a calming potion. Go back down, and to the right to the next area. Go right until you come across a canon, and click on it. Aim the canon where ever you want, and click again. The coconut with a potion in it will shoot out of the canon, and the shark will jump up and eating it, quickly falling asleep. Now you can swim across. Exit out of the canon shooting, and swim across the water to the next area. There will be two people over there: Professor Hammerhead, and a little boy. Click on one of them, and they will begin following you. Lead them back toward the left, into the next area, and across the two bodies of water onto the beach. 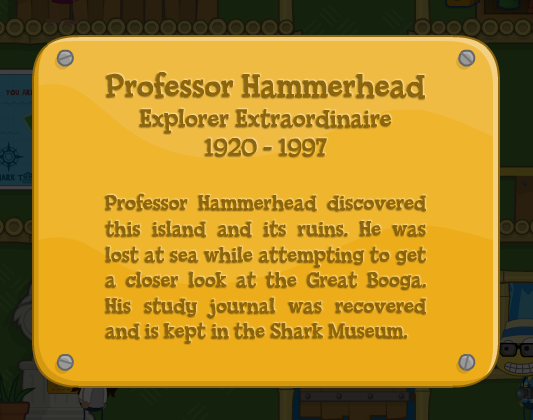 As you arrive, the little boy’s mother will begin thanking you, and Professor Hammerhead will give you your medallion.